John Smith, who lives in Buckie, helped support the Allies’ invasion of Normandy just two days after his 18th birthday. For more than seven decades he thought his part in one of the key moments in World War II would go uncelebrated. However, the 92-year-old’s daughter, Helen McNab started pursuing the French government to recognise her father’s contribution two years ago. 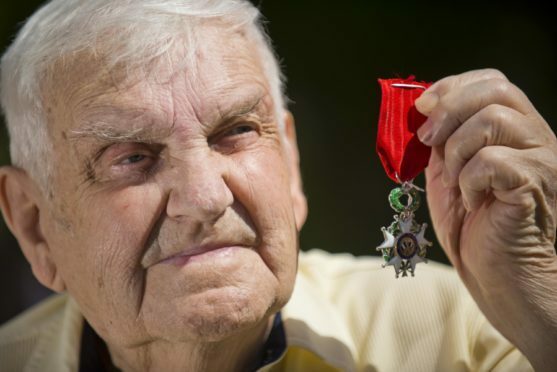 Now Mr Smith has received his medal to join the French Legion of Honour – just months after Mrs McNab died in January. He said: “I wasn’t that bothered about it but Helen said it wasn’t for me, it was for the grandchildren. “When she passed away I thought that would be the end of it. It just came through the post, a total surprise. The Legion of Honour was founded by Napoleon in the early 19th century and remains the country’s highest military award. Mr Smith spent his entire working life at sea – starting out as a cook when he was 14 years old on a boat based at his native Findochty. His initial service during the war involved him tending to Arctic convoys arriving and departing at Loch Ewe, near Ullapool, on board his father’s ship. He added: “I wanted to join the merchant navy. My father agreed but when it was time for me to go he wouldn’t let me. I think he must have known D-Day was coming. “I just told him that if he didn’t let me go then I would just sit down and do nothing – I went on strike – so he let me go. Mr Smith still has his service documents, which show that from 1944 to 1945 he was on “special operations for the liberation of Europe”. The seaman made countless trips across the English Channel during that time – initially shipping ammunition.